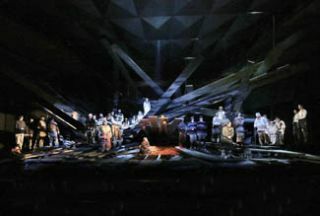 Classical music recording and production company Soundmirror, an early adopter of Lectrosonics wireless technology since acquiring the manufacturer’s 200 Series analog transmitters nearly 20 years ago, recently put the first Lectrosonics Venue 2 Digital Hybrid Wireless modular receiver to work on the world premiere of "Cold Mountain" at the Santa Fe Opera in New Mexico. A number of transmitters were deployed in the minimalist scenery in order to unobtrusively capture some of the on-stage action. The dual-battery SMQVs were mainly reserved for the female singers, where the smaller pack was a better fit for the tighter costumes, according to the company. “The nice thing about the Venue 2 is being able to tune across three full blocks with a single unit,” said Donahue. Designed to address the challenges of increasingly congested RF environments, the new receiver tunes across a 220 MHz range, matching the tuning ranges of the SSM and L Series transmitters, including the LT body packs used on "Cold Mountain." Each of the Venue 2’s six receiver modules covers 75 MHz, or three Lectrosonics blocks. “From a logistical standpoint, walking into a location where we can use blocks 21, 22, and 23, it’s easy enough to find frequencies that work," said Donahue. "But once you start operating all 30 wireless channels in close proximity to each other on a 46-foot by 28-foot stage, there’s always a need to adjust some frequencies. Being able to move between blocks without having to think about what hardware we have is a quantum leap forward for us." Williams said that Lectrosonics provided him with a plot of the available frequencies in Santa Fe, but the day before the opening he had to change some packs around. “The tuning on the Venue 2 is even quicker than on the transmitter—it’s very quick, very simple, and very intuitive."